Incredibly, the Wall Street caucus in Congress is trying to slip a major attack on hard-won financial reforms into a spending bill designed to keep the government running. As reported by The Huffington Post’s Zach Carter, the deal would “provide taxpayer backing for risky Wall Street trading” in derivatives. We’re asking people to sign this emergency petition now to defend Wall Street reform and to reject this rollback of protections in the Dodd-Frank financial reform bill. Bank lobbyists have been pushing the provision for several days, earning the ire of bank-reform-minded Democrats including Sen. Sherrod Brown (Ohio) and Rep. Maxine Waters (Calif.), the top Democrat on the House Financial Services Committee. Those objections hit critical mass late Monday, as word spread on Capitol Hill that Democratic negotiators had agreed to a bid from House Appropriations Committee Chairman Hal Rogers (R-Ky.) that would effectively subsidize much of the derivatives business. In exchange, Senate Appropriations Committee Chairwoman Barbara Mikulski (D-Md.) secured additional funding for the Commodity Futures Trading Commission, the agency tasked with overseeing derivatives, the complex financial contracts at the heart of the 2008 meltdown. 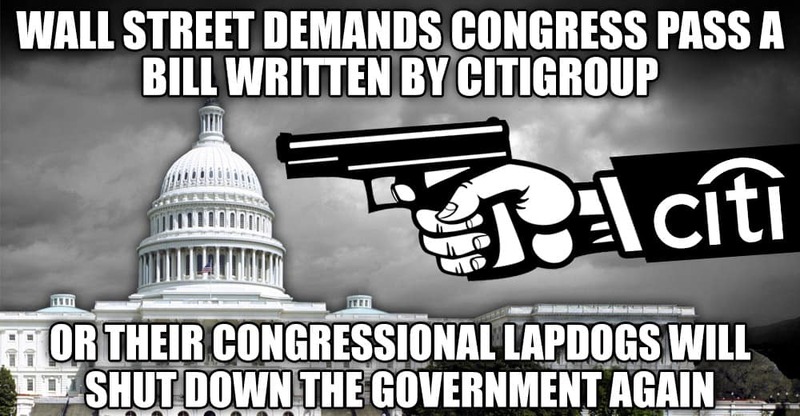 The New York Times reported in May that lobbyists for Citigroup and other big banks have been writing bills that have passed through the House Financial Services Committee virtually unadulterated. One of their goals has been to remove the restrictions on derivatives. Schumer is resisting the deal, so far. But the pressure to cut a deal is intense. We need to flood Congress now with demands that this deal be rejected.